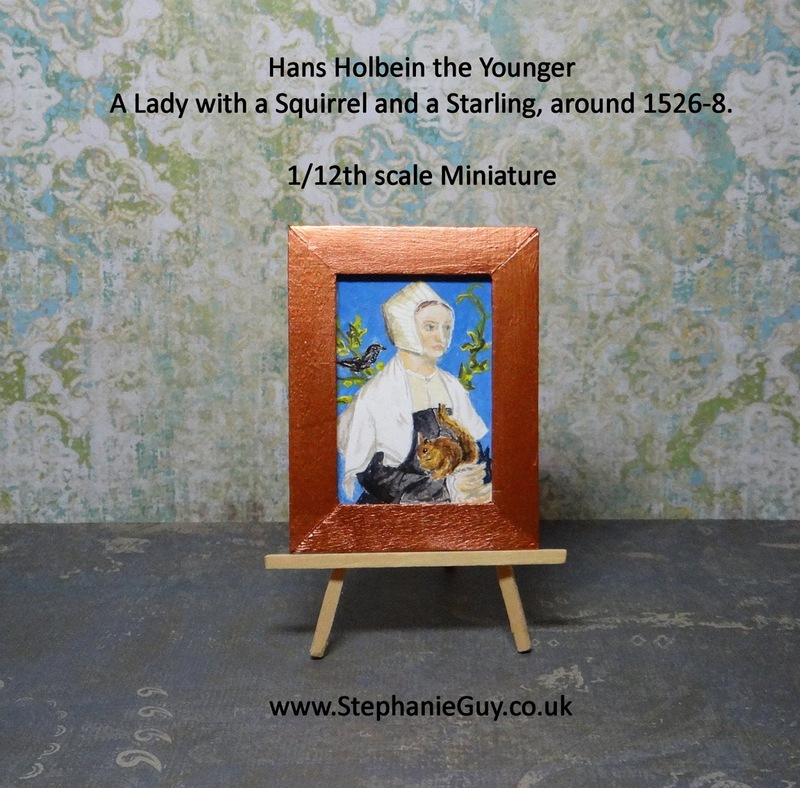 Stephanie Guy Fine Art: Tutorial in Miniature: Hans Holbein the Younger's A Lady with a Squirrel and a Starling, around 1526-8. 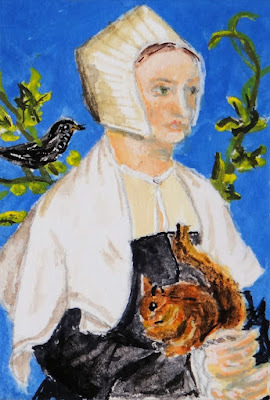 Tutorial in Miniature: Hans Holbein the Younger's A Lady with a Squirrel and a Starling, around 1526-8.
employment in King Henry VIII’s court. 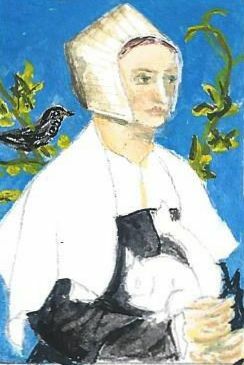 He had several high society patrons including Sir Thomas More, Anne Boleyn and King Henry VIII himself. Notably, it was Holbein that painted the now infamous portrait of Anne of Cleves prior to Henry’s marriage – fortunately for Holbein, Henry VIII blamed Cromwell for this disastrous marriage arrangement and not the artist. 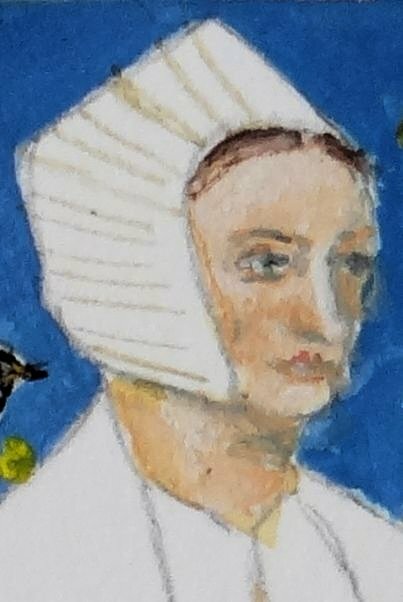 Towards the end of his life, Holbein began to paint miniatures, mounting some of them on playing cards. 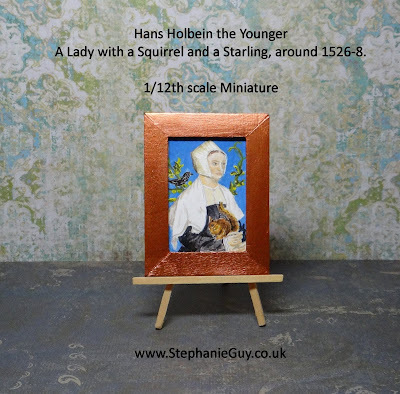 Can you imagine painting a miniature Holbein in miniature? 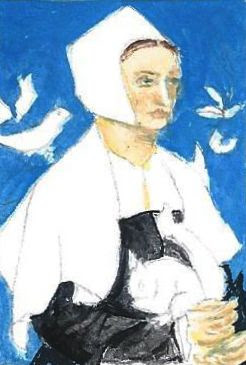 Holbein the younger died in 1543, possibly of the plague. Holbein’s painting A Lady with a Squirrel and a Starling measures 56 x 38.8 cm. To find how big yours needs to be simply divide these measurements by the scale you're working in. On a 1:12th scale, dividing by 12 will give us 4.67 x 3.2cm; for 1:16th we need to divide by 16 to get 3.8 x 2.43cm; and for 1:24th divide by 24 giving 2.33 x 1.6260. Using the brush tip of a 00 sized round brush pick up a small amount of Primary Blue and wipe it onto your clean palette or mixing plate. 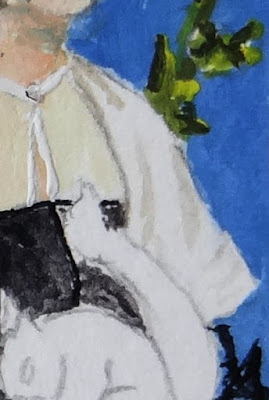 Clean your brush and repeat picking up Ultramarine and Primary Yellow. Mix to form a slightly greeny blue colour and using your size 00 brush, paint the background. Add a touch more water as you move down the painting so that is it a little darker at the top than at the bottom. 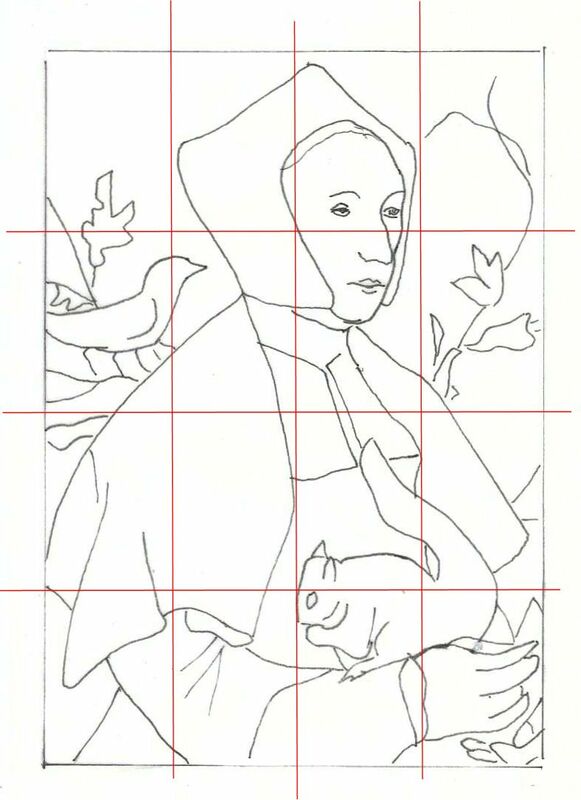 Turn the painting as you go so that the point of the brush is against the line of the drawing, this will help you to stay off the areas that you want to keep clean. Dip the end of your clean brush directly into the Primary Red tube and wipe it on the palette. Clean your brush and dip it into the Primary Yellow tube. Mix this into the Primary Red on your palette. Now take around twice that amount of Zinc White and mix into the Primary Yellow/Primary Red combination. Test the colour on a scrap of paper. Is it flesh coloured? Perfect! If not, keep adding the tiniest amount of whichever colour is missing – if it’s too yellow, add red, if it’s too red, add yellow, if it’s too strong add white – until you have a flesh colour. It’s not easy, so be patient. Use your flesh colour to paint the face, hands and neck. Now add a little more Zinc White to one third of your flesh tone to make a highlighting colour and allow the rest to dry out a little. Removing water from the mix will intensify the colour, which is needed for lowlights. When we’re finished with the face we do not want to be able to see any pencil lines at all. Note - if your pencil lines are heavy like mine, you might like to paint a few more layers of your base flesh colour over the entire face before you begin with the high and low lights. Swap to the 0000 brush and paint highlights down the nose, on the forehead, top of the cheek bones and chin. Add lowlights to the hollows of the cheeks, the side of the nose, under the chin, the eyebrows, the top and bottom of the right eye and the side of the neck. Move onto the hands and paint highlights on the tops of the fingers and right hand, and lowlights on the underside of the fingers. Add a touch of Primary Blue to the flesh mix and add shadows to the nose outline, the nostrils, under the chin and under the double chin, underneath the eyes, the crease line on the eye lid, the middle line of the lips and the underside of the lowlights on the hands. Dip the end of your clean 0000 brush directly into the tube of Zinc White and use this to re-establish the whites of the eyes. 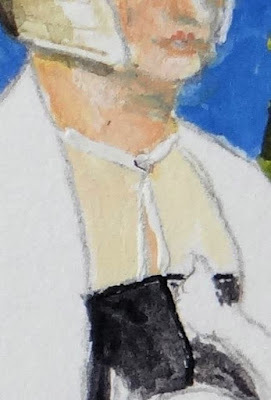 Picking up the paint directly from the tube means that it will give the maximum opaqueness to cover the skin tone that is currently where the whites of the eyes should be. Add a touch of Primary Yellow to the edge of the blue mix that we used on the background to make a green-grey and dot in the iris of both eyes. Make the irises big enough to disappear underneath the top lid – if you can see the whole of her iris she will look surprised. Mix Burnt Umber and Ultramarine in roughly equal quantities to make a medium to dark grey and use this to add a single dot for the pupil. Now using the same grey, paint along the upper eyelash line. Add a touch of Primary Red to your base flesh colour from step 3 and dot in the cupid’s bow of the lips. Take a tiny amount of Zinc White and add the smallest highlight to the lower lips. Paint the two sides of the hair in Burnt Umber leaving a little gap where the parting is. Darken the top of the hair where the cap is casting a small shadow using a touch of Ultramarine mixed with Burnt Umber. Soften the edges of the hair by tickling it with a clean damp brush. Add a little Burnt Umber to the right hand side of the right hand eyebrow to make it a little more defined. Mix Burnt Umber and Ultramarine in equal amounts straight from the tube to make a very dark grey/black. You can use a ready mixed Ivory Black if you have one. I tend to shy away from ready mixed blacks as they tend to be flat and uninspiring, however on this scale I don’t think it matters much. While the mix is fresh, paint in the darkest of the blacks on the dress including the creases and the shadows. 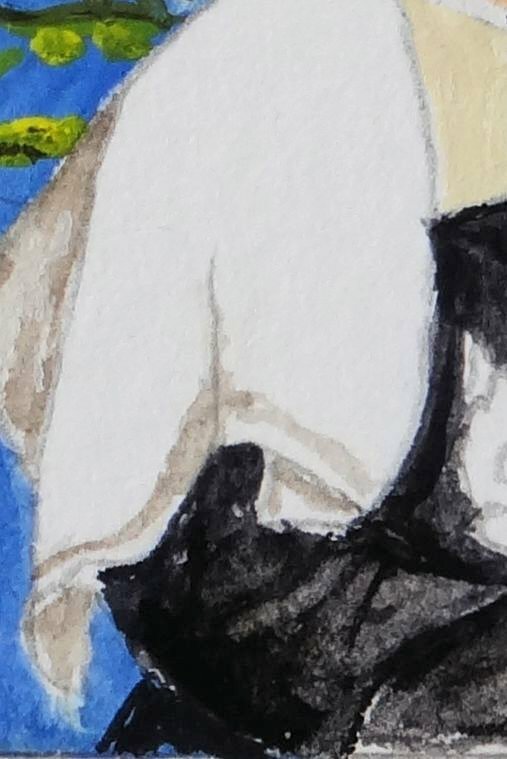 Add some water to your dark grey/black and paint in the rest of the black dress, keeping it darker on the outside edge of her right arm, and where her right arm casts a shadow to the left of the squirrel. Mix some fresh dark grey/black and using directional brush strokes following the feathers, paint the starling. Leave some white patches showing through to define the wing. When the dark grey/black is fully dry, add a few Zinc White dots on the underside of the starling’s chest and up the neck. Add a single white dot for the eye highlight. Paint a line of Yellow Ochre along the centre of the beak. Next we’ll tackle the foliage. Mix a nice fresh spring green using Primary Yellow and Primary Blue, a mid green using Primary Yellow and Ultramarine and a very dark green by adding a touch of Primary Red to Permanent Green Middle. Now using pure Primary Yellow straight from the tube, paint over all of the leaves. 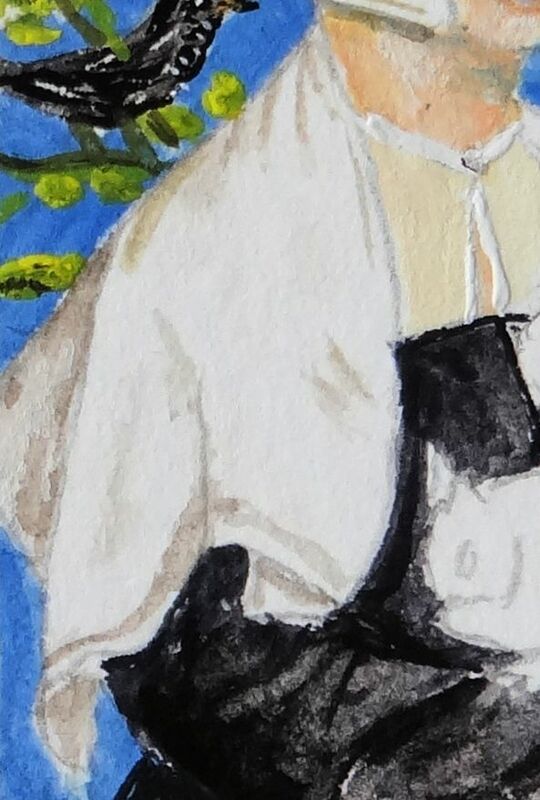 Use dots and dashes to establish a foliage effect and add in a few extras peeping out from behind the lady’s right hand arm on the left of the painting. Paint in the mid greens and dark greens to give the leaves structure, leaving some Primary Yellow showing along some of the edges to make it look like the sun is shining. Add a tiny touch of Burnt Umber to the edge of your mid green to make a greeny-brown for the branches, this needs to be more on the green side than brown. Firstly paint the branches in Primary Yellow, then paint over using your branch mix, again leaving some Primary Yellow to show through where the sun is catching the branches. To give the white hat structure we need to paint the shadows rather than paint the hat. Mix Burnt Umber with Primary Blue and split this into two parts on your palette. 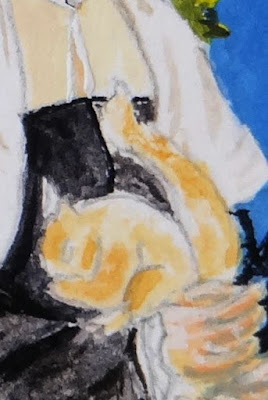 Add a touch of Yellow Ochre to one half and add water until this mix is very pale. Test it on a scrap of paper to make sure that it isn’t too strong before adding it to your masterpiece, painting in the “horizontal” lines of fur on the hat. 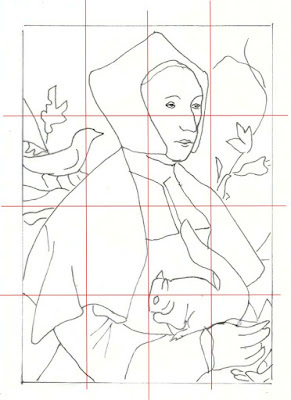 Start with the point on the right hand side of the hat (left hand side of the picture) and paint a line that, if it were to continue beyond the hat, would meet with the outside corner of the lady’s eye. There are 5 more or less equally spaced lines above this one, no line at the very top, and six lines below this one – the very last one is close to the edge of the fabric. Stop your lines before you reach the front of the hat. Using the same mix, add in shadows to the hat on the left hand side of the painting, all the way from the point to below the lady’s right ear. Paint a line just inside the edge of the hat all the way around the face – this will give the hat a luxurious depth. Now add water to the mix that does not contain Yellow Ochre and strengthen the shadows on the far left hand side of the picture, around the outside edge of the hat. Again, test your paint for strength before you apply it. Strengthen the shadow along the bottom of the hat by the lady’s neck. Finally, using pure Zinc White, re-establish the hat on the left hand side of the lady’s face (the right hand side of the painting). Moving on to the top of the lady’s dress, mix Primary Yellow with a touch of Primary Red, then add Zinc White until you have a very pale peach and paint the top of the dress. Using pure Zinc White straight from the tube paint the edges of the fabric over your pencil lines. Don’t worry too much about covering all of your pencil lines as some darker lines will read as shadows and will help to define the dress. Just as we did with the hat, to make the cape read as white we need to paint the shadows cast by the folds in the fabric. Go back to the Burnt Umber/Primary Blue mix that we used on the hat and add a touch more Burnt Umber to make a brown-grey, and dilute with water until it is quite pale. We’ll use this to define the cape. 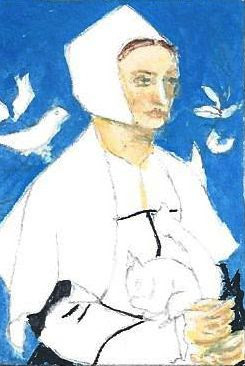 Start on the far left of the painting behind the lady’s right arm and paint along the fold line, then blend inwards with water. Repeat this from the outside of the cape leaving white inbetween the two lines that you have just painted. Next paint a line along the bottom of the cape, a little in from the edge, and paint a line up the fold right over the arm. Now paint in the pointed underside of the cape by the outside of the elbow, and paint along the line of the underside of the cape by her inside elbow. 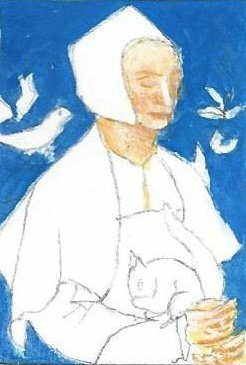 Using the same Burnt Umber/Primary Blue mix, paint in a few lines on the cape at the top of the shoulder and soften by tickling with a damp brush. Add two fold lines by the top of the dress. Now add water to your mix to dilute the colour and paint in a few patches where the fabric is gently undulating and casting shadows. Moving on to the opposite side of the cape, paint a line down the inside edge to give it depth. Add a small line on the shoulder, then add more water and paint in a few soft undulations where the fabric follows the contour of the left arm. Add a touch more Primary Blue to make you mix tend towards blue rather than brown and add in a wiggly line on the white fabric on the lady’s wrist. Now for the squirrel. Pick up a small amount of Burnt Sienna from the tube and wipe it onto your palette, near to your Burnt Umber and Yellow Ochre. Dampen the whole of the squirrel with clean water and wait for it to dry to a sheen. Before it has completely dried, tickle in an undercoat of Yellow Ochre. When this layer has dried, go back in and strengthen the Yellow Ochre along the upside of the tail, front and back and legs, and the top and bottom of the face. 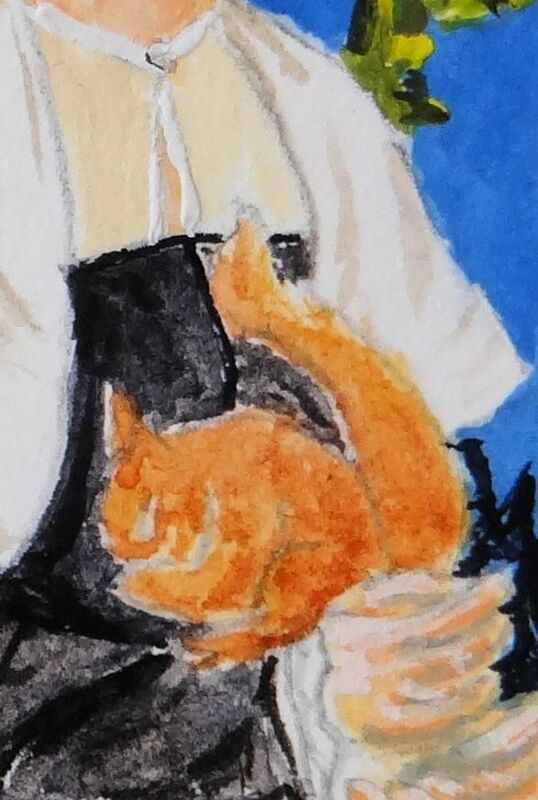 Dilute the Burnt Sienna and paint a layer over the top of the squirrel. You should be able to see the yellow ochre under layer showing through. Using Burnt Umber define the darker areas of the squirrel – under the chin, under the foreleg and hindleg, across the back and up the tail. Work in the direction of fur growth using small strokes of the brush. Paint the eye with neat Burnt Umber and when this is dry, add a tiny spec of neat Zinc White in the centre of the eye to highlight and bring it to life. The pet squirrel is on a chain, so dot in a tiny line from the underside of the squirrel’s front leg across to the lady’s hand. It goes behind the back leg, so there is no need to show the chain here. I cannot see a signature on Holbein’s original painting so we shall call this done. I made a simple frame for mine out of lollipop sticks, and painted it using copper acrylic paint to compliment the squirrel. If you have a go at any of my painting tutorials I’d love to see your artwork, you can share it here, on my facebook page or email it to me. I love it! Great tutorial :).